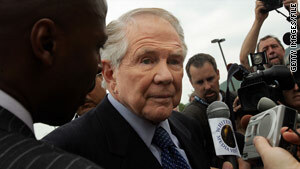 (CNN) -- Televangelist Pat Robertson wasn't blaming Haiti's catastrophic earthquake on "God's wrath," but was talking about a "widely discussed" legend that a Satanic pact aided its founding slave revolt, a spokesman said. Haiti, the Western Hemisphere's poorest country, has faced a string of natural disasters in the past two decades and been wracked by political chaos for much of its history. In a statement posted on the broadcaster's Web site, Christian Broadcasting Network spokesman Chris Roslan said the "widely-discussed" legend, "combined with the horrible state of the country, has led countless scholars and religious figures over the centuries to believe the country is cursed." But, he added, "Dr. Robertson never stated that the earthquake was God's wrath." "If you watch the entire video segment, Dr. Robertson's compassion for the people of Haiti is clear. He called for prayer for them. His humanitarian arm has been working to help thousands of people in Haiti over the last year, and they are currently launching a major relief and recovery effort to help the victims of this disaster." Robertson has previously linked natural disasters and terrorist attacks -- including Hurricane Katrina, which killed more than 1,800 people on the Gulf Coast in 2005 -- to legalized abortion in the United States.